If you are not overtly opposed to all things Sci-Fi – as my wife is – I highly recommend the show Battlestar Gallactica. I’m on season two, and some of the characters have survived a nuclear holocaust for months by popping anti-radiation drugs. I wondered if I too could survive a nuclear fallout with the right meds. Anti-radiation pills do exist, and are effective at reducing radiation poisoning, but long term exposure would not be survivable, and the pills only work to prevent the poisoning. They have no effect if you have already been exposed. The pills are made of Potassium Iodine (KI) which fill your thyroid gland with good iodine before it’s able to absorb radioactive iodine. This protects your thyroid from radiation, which is very important, but it doesn’t protect your lungs, skin, and other internal organs. So God forbid you find yourself walking around in a nuclear wasteland with a box of KI pills, remember that Sci-Fi has the Fi for a reason. Take your pills, but make your way underground (Brendan Fraser style) ASAP. 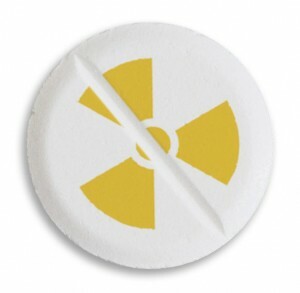 Can a pill save you from radiation poisoning?